Farmer’s Markets are places where local farmers gather to sell ultra-fresh fruits and vegetables. Some Farmer’s Markets even have meats, cheeses, honey, and bakery products. Typically, Farmer’s Markets are temporary booths, tables, or stands that are set up indoors or outdoors, unlike regular markets that are open year-round. Farmer’s Markets are usually weekly. So what’s the difference, and more importantly, what’re the benefits of Farmer’s Markets? Eating fresher food. At Farmer’s Markets, you get food in it’s purest form. You won’t find processed food at Farmer’s Markets. This is important for making sure you’re eating natural foods, so you can live healthier and practice natural wellness. Knowing where your food comes from. It’s nice to know the person who is feeding you; Farmer’s Markets allow you to do so. Keeping money in the community. When you shop at Farmer’s Markets, the money you spend stays in your area. This is important because you’re contributing to the growth and wellness of your neighbors. Less “friction” to making a sale. When a Farmer sells at an open-air market, he or she can have direct contact with a customer. This allows a farmer to listen to customer feedback, straight from the customer. Less time in storage. When selling via supermarkets, Farmers have to ensure their goods are cool, safe, and fresh while traveling long distances. Less cost. When selling in a Farmer’s Market, a farmer doesn’t have to pay several people to sell his food. To find a Farmer’s Market in your area, use this tool called LocalHarvest. 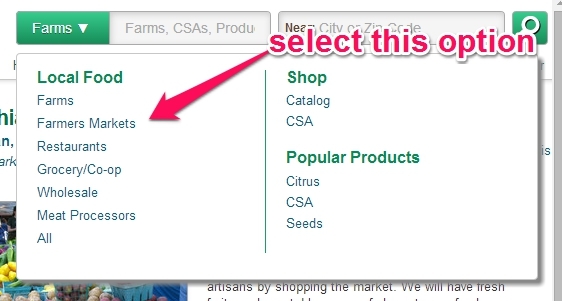 Be sure to select “Farmer’s Market” from the dropdown, so you see only Farmer’s Markets; however, if you’re interested in other local food options, you can search for those too. Shop. Did you know that for every dollar you spend at a grocery store, only 16 cents goes to the farmer? The other 84 cents go to marketing and travel costs. When you shop at Farmer’s Markets, farmers, on average, keep 95% of what you spend. The other 5% goes to rent and other associated set-up costs. Volunteer. Farmer’s Markets are not highly commercial entities like supermarkets and chain grocery stores, so they do not have large amounts of resources. Farmer’s Markets are started by a nonprofit organization, local government agency, or a farmer. All three of these entities require community support to function. If you enjoy eating locally, supporting your community, and want to help, contact and reach out to the Farmer’s Market most convenient to your location. Offer services. Another way to support your Farmer’s Market is to offer what you do at a discount. Maybe you’re an accountant or you’re a lawyer. Perhaps you’re good with designing flyers. No matter what you do, chances are you can offer your service at a reduced cost for the Farmer’s Market or to the farmers. Here are some of the best foods to find at your local Farmer’s Market. Tomatoes. Grocery-store tomatoes are incomparable to a Farmer’s Market tomatoes. Freshly grown tomatoes are also higher in antioxidants, so you don’t just get a better tasting tomato, you get tomatoes that’re better for your health. Carrots. At Farmer’s Markets you’ll find carrots of all shapes and sizes. You’ll even find carrots in different colors, like yellow, purple and white. These freshly-grown carrots have higher antioxidant values than commercially grown orange carrots. Berries. Berries have a short shelf life, so the cost of keeping them fresh is high. Most berries in grocery stores are from other countries, so there’s a lot of pollution and energy spent to get them to your fridge. But why bother with grocery store berries? Your local farmer has fresh ones. 1. Get there early. Farmer’s Markets are first come first serve, so getting there early means you’ll have first pick what’s offered. Also, less people are there at the beginning, so you can avoid the crowd. 2. Get there late. Alternatively, you can arrive just before closing to see if you can get a last minute deal. Some farmers may give you a large amount of product for a discount, so they don’t have to take it back to the farm. Just don’t forget that farmers have to make a living, so don’t try to make a deal that’s unreasonable. 3. Ask a farmer how to prepare. If you’re unsure about how to cook something, ask a farmer. They will gladly share how to prepare, cook, and enjoy the foods they grow. Not only do you get fresh food, you’re getting cooking advice. 4. Bring your own bags. Farmer’s bring bags, but they’re often flimsy and plastic. Bringing your own lets you carry more, and keep plastic out of the environment. Farmer’s Markets are a critical part of natural wellness. Not only do you get to enjoy fresher foods, you’re helping your community. Eating the fresh food keeps your body healthy and allows you to avoid weight gain. Processed foods damage your body, and make it difficult to exercise. To hear more about natural weight loss, visit http://renewweightloss.com. Renew is a physical guided, natural weight loss program based on whole, real foods. It’s a way to lose weight, while preserving muscle. Renew, combined with a regular visit to the Farmer’s Market, is the best way to live a long and healthy life.